A guide to deployment, management, And concept overview For FOG. This document is intended to be modified by FOG users, in fact it is based on a document created by a FOG user. If you feel something could be said better or put more clearly, it is encouraged that you make changes to this document. We just ask that you keep it constructive and in good taste. In order to edit the wiki you are now required to create an account, as spamming of the forum has gotten pretty bad recently. FOG is a Linux-based, free and open source computer imaging solution for Windows XP, Windows Vista, Windows 7, Windows 8, and Linux (limited) that ties together a few open-source tools with a php-based web interface. FOG doesn't use any boot disks, or CDs; everything is done via TFTP and PXE. Your PC boots via PXE and automatically downloads a small Linux client. From there you can select many activities on the PC, including imaging the hard drive. Also with FOG many network drivers are built into the Linux client's kernel, so you don't really need to worry about nic drivers (unless there isn't kernel support for it yet). FOG also supports putting an image that came from a computer with a 80GB partition onto a machine with a 40GB hard drive as long as the data is less than 40GB. FOG supports multi-casting, meaning that you can image many PCs from the same stream. So it should be as fast whether you are imaging 1 PC or 20 PCs. How should FOG be implemented? FOG is best implemented on a dedicated server, any spare machine you have. We recommend that you have sufficient hard drive space as each image you make is usually between 5 and 10 GB. Using a RAID array allows imaging multiple computers simultaneously without much performance degradation. A gigabit NIC is recommended. For faster image compression and decompression, provide as much processor and RAM as you can make available. What features are included with FOG? FOG is more than just an imaging solution, FOG has grown into an imaging/cloning and network management solution. FOG now performs tasks like installing and managing printers, tracking user access to computers, installing applications remotely via snap-ins, automatic user log offs and computer shutdown on idle timeouts. If a computer is badly infected with a virus or malware, you can boot FOG in AV mode and have it remove the viruses. You can wipe your disks, destroying all information that was on them, restore deleted files, or scan the disk for bad blocks. How much does FOG cost? FOG is an Open Source project and licensed under the GPL which means that you are free to use FOG on as many computers as you like for free. This also means that if you want to make any changes to the source code you are free to do so. The creators of FOG make no profits from this project with the exception of donations. FOG comes with absolutely NO WARRANTY and the creators of FOG are in NO WAY RESPONSIBLE FOR ANY DAMAGE OR LOSS CAUSED BY FOG! Please see the license file included with the FOG release for more information. With that being said we attempt to do a very good job of supporting our users, in fact it is one of the goals of FOG to have better support than most commercial products. All support requests should be placed through the FOG's forum which is located at: http://fogproject.org/forum/ Thanks for supporting open source software and enjoy! Working in an educational environment our organization's techs very often re-imaged computers in their day to day activities. For a long time we used a commercial product that in many ways didn't meet our needs. It wasn't web based, and you needed to create driver disks, floppys or USB drives. Other things were very difficult, such as searching for a host by MAC address and the product was expensive, even with an educational discount. So we started to investigate ways in which we could do things better, and as our organization struggled to make a commercial product work better by trying to pxe boot dos, and testing it in Windows PE, we, the FOG Team started to build linux based solution on our own time. We finally got a working version and decided to release it as open source since we use many other open source products, and figured we should give back to the community. This section provides some basic concepts that the FOG Project uses. This occurs when scheduling a "Download" task, "Quick Image", or during "Full Registration" the user selects image after registration. The server (or storage node) will directly send packets (the image) to that Host's MAC address.(aka. TCP) This is excellent for directing network traffic. This can be performed under Groups running multiple unicasts to multiple hosts. However, all the hosts will not finish at exactly the same time. The image is broken down into chunks and indexed to create a torrent file. The server (or storage node) beings creates the torrent and starts seeding. The hosts request the torrent and start downloading chunks for the torrent. Once a chunk is received then the hosts will seed that chunk to other hosts. Once torrent is done downloading it will start imaging. Then the partition is rewritten to accomidate the size needed to download the files originally. If one host gets "hung up" the other host are not affected, but marginal time and speed are lost. What is iPXE and the difference between the files? Check out the iPXE page. FOG is a typical LAMP software bundle, so the main server is a Linux box. The rest of the components: Apache, MySQL, PHP, and several other services, are automatically downloaded and installed by the FOG installation script. This listing is for informational purposes only, as the required components will be automatically downloaded and installed by the FOG installation script. The LAMP setup can also be easily adjusted for a "WAMP (Windows Apache MySQL PHP) system" though will require a bit more knowledge of what packages to use and how to integrate with the FOG system. For all versions 0.33 to current(1.3.0beta) use undionly.kpxe is generally recommended for option 67. 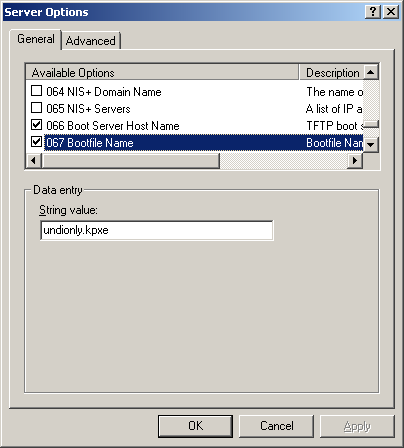 Other files that can be used are listed in your directory "/tftpboot"
If you do not use FOG to provide DHCP services, the following sections will give some indication of settings for DHCP servers on various platforms. 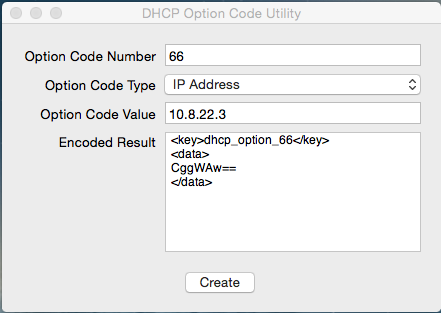 Use OS X Server app to install and utilize DHCP. Use DHCP Option Code Utility to generate the code necessary. One MUST generate the codes in order for PXE booting to work! This is a sample file DO NOT USE THIS IN YOUR ENVIRONMENT!!!! OS X Server app will generate most of this code for you, this example file is to show you the place where the generated code needs to be placed. For Reference, your generated code should be placed between "dhcp_domain_search" and "dhcp_router"
The FOG setup script asks several questions which might not be obvious. These sections describe only the most generic settings. The easiest method to image machines and get started using FOG is on a small, isolated network. The FOG setup program will configure all the necessary services for you completely automatically. This section covers only those basic steps. Slightly more complicated is the task of integrating FOG into your existing network infrastructure. This section attempts to describe the steps to link FOG with a fairly generic enterprise system. This methods allows to use Fog in existing network without the need of controlling existing DHCP server. Does NOT required you to input the MAC addresses of FOG clients. See Setting up ProxyDHCP. So you have a FOG server installed and setup, now what do you do? Below are a few common "Getting Started" items. FOG requires that all hosts be entered in the FOG Database for imaging. The most important part is getting the MAC address of the host right. FOG uses the MAC for targeting image installs and acquires. Using the wrong MAC could result in unpredictable results, including the complete erasure of the wrong pc! The IP address isn’t that important, and the ‘name’ field is more for the user. Mac address format is 00:12:3F:C4:57:0C . Using dashes, spaces, or no items at all will result in the GUI not accepting the host. After hosts are entered, it is wise to group them together by function, hardware, or common image. The image will be shared among all members of a particular group. This occurs within the ‘hosts’ screen, and NOT on the groups screen. This is a little confusing, so it helps to think of the ‘groups’ screen as a task generator, rather than controlling group memberships. "00:c0:4f:18:62:63","Hostname","1.1.1.1","Your description","XP/Vista","Image filename to use"
Hosts are then configured to boot via PXE boot by going into the BIOS. Make sure PXE boot is the FIRST option, NOT the hard disk, or things won’t work. Configure your ‘master’ pc for the first image. Probably a good idea to run ‘sysprep’ prior to imaging, but not necessary. Sysprep will make your imaging life easier, if hardware is different, etc. See Microsoft.com for more details on using sysprep. Key Term: Host --> The computer that will be registered to FOG and imaged(capture/deploy). Client usually refers to the Client service later described in this guide. FOG's strength can be better harnessed if some time and work is put into preparing a master image that fits the needs of your environment. Pre-Installing the FOG service, etc. Sysprep, Hardware-Independent Images (HAL), and Driver integration. The link above opens the Main Managing FOG document and has a Table of Contents of its own. Provides an overview of the GUI and explains the symbols used on the Menu Bar. This section covers management tasks such as: Adding a new host, Managing Hosts, Host Status, and Creating Host Groups. This section provides an Overview of sorting hosts into useful Groups, and provides instruction on Managing Groups. Also describes Creating, Modifying Image Objects, and Adding Images to Existing Objects. This section introduces the concept of Storage Nodes, which provide scalability to FOG with the ability to "share the load of computers being imaged." Also covered are Adding Storage Nodes, Monitoring Image Replication between nodes, and Understanding the role of the "Master Node" in a group. In addition, this section details the necessary steps to include PXE and TFTP Services for a node located on a remote network segment. This is a major section of FOG Management because all day-to-day client management is initiated within the FOG Tasks section. The Overview Section provides a quick list of tasks available within FOG. Describes advanced settings available for scheduling tasks including Shutdown after Execution, Single Task scheduling, and setting a CRON-Style Task. A service that runs on client computers allowing FOG to better manage them. Provides Active Directory integration, the ability to change a Hostname, Green Power management, Snap-in installation, User tracking, Printer Management, and more. For FOG 1.3.0 Power Management, see Power Management. The FOG client can be partially or fully-enabled by modifying the ini file. After installing FOG server on your machine, log into the web gui. If you take note of the Footer of every page of the web gui you will see a few links there. One being the FOG Client. This link will take you to the Client Management page. Here is where you will find the Legacy Client and New Client services, along with FOG Crypt. NOTE: It is not recommended to use the Legacy and New Client services in the same environment. A typical client installation, Silent installation, and a video tutorial. netsh advfirewall firewall add rule name="Fog Client" dir=in action=allow program="%ProgramFiles%\FOG\FOGService.exe"
netsh advfirewall firewall add rule name="Fog Service" dir=in action=allow program="%ProgramFiles%\FOG\FOGServiceConfig.exe"
netsh advfirewall firewall add rule name="Fog Tray" dir=in action=allow program="%ProgramFiles%\FOG\FOGTray.exe"
netsh advfirewall firewall add rule name="Fog Client" dir=in action=allow program="%ProgramFiles(x86)%\FOG\FOGService.exe"
netsh advfirewall firewall add rule name="Fog Service" dir=in action=allow program="%ProgramFiles(x86)%\FOG\FOGServiceConfig.exe"
netsh advfirewall firewall add rule name="Fog Tray" dir=in action=allow program="%ProgramFiles(x86)%\FOG\FOGTray.exe"
How to update the FOG client. Logs are usually located at C:\fog.log. 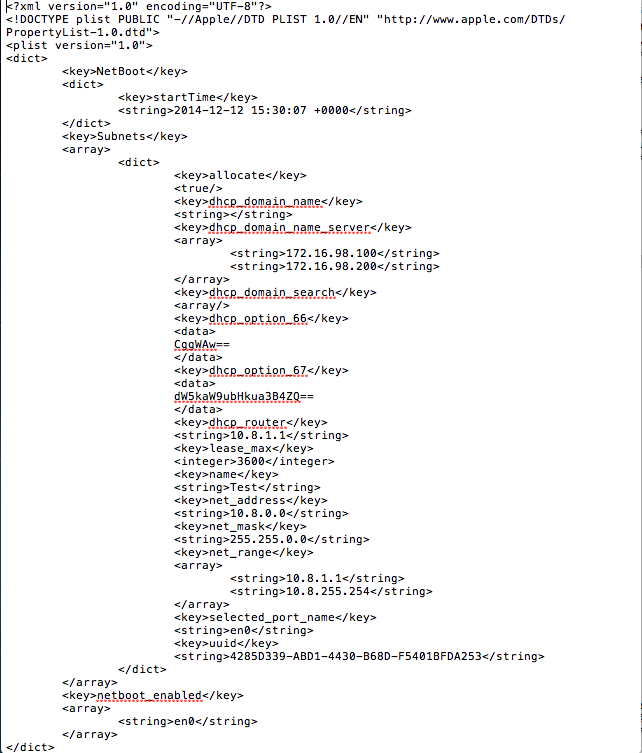 If the log is not here, this generally means the log path was changed during installation, and is probably in fog's program directory. A FOG Snap-in is anything that can be run on a Windows client. This can be just about anything, including: installing applications like Firefox or Microsoft Office, adding an icon or shortcut to the desktop, or tweaking a registry key. This section covers Creating a Snap-in, adjusting the FOG server to handle snap-ins larger than 2MB, Uploading the Snap-in into the FOG system, and Linking the Snap-in to hosts. Plugins enhance FOG's functionality. See Plugins to activate and manage plugins. As of FOG v1.3.0-r2651 the fog user can now add Image Deploy to the Fog iPXE Menu(For All Hosts) and then select the exact image desired without having to do any registration. BUT intervention is still required to start imaging. WOL packets operate at the layer 2 of a network meaning that it can only reach it's "Subnet"
If you would like to create your own plugins here is a template to follow. 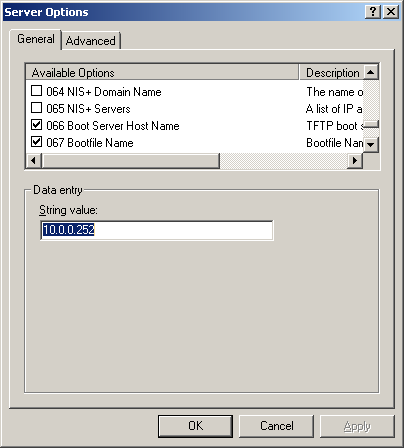 In this setup, the TFTP server and the DHCP server are hosted on a separate server. The TFTP server holds the PXE boot files including the Linux Kernel, boot file system image, and pxe config files. The DHCP server is the server that assigns the clients with IP addresses and network connection information. This extends the work done in the above article, Including multiple PXE / TFTP servers, and extends it a bit to allow for FOG nodes to be used in various locations that pull from a central server. Edit the storage node definition with the IP address of your NFS server and set the image location to the path on the nfs server. Make sure it has a file called .mntcheck in the root of the share, a directory called dev and a .mntcheck file in the dev folder. KNOWN ISSUE You will get an error "Ftp connection to storage server has failed" at the end of capturing images though. You will have to manually rename and move the file from the dev directory to the directory below. If your NFS server supports ftp as well, enable ftp on it too with the username and password specified in the storage server settings and this message will go away. Hopefully someone will re-write POST_Stage2.php to change this at some point as if you already have the NFS share mounted why do we do this bit with ftp? "Unable to find a valid task ID based on the clients mac address of: <mac address>". if you add an @ sign before the ftp commands it appears to have fixed the issue. This is not about a seperate NFS server in general, but about how to change the local storage directory and export it correctly. See Change NFS location for more. This section is intended to bring together the most common issues from the forums. Jaymes is an aspiring software engineer and Ubuntu nut. He began working on his degree at University of Advancing Technology in Tempe, AZ but currently works as a Technology Support Specialist for Seymour Community School Corporation out of Seymour, IN. Jaymes spends his time breaking what isn't broken, and working on private projects that deal in html, php, and mysql. You can contact Jaymes by using the FOG forums. Tom Elliott is the Senior Developer for FOG computer imaging solution. He is a technical support specialist for Burlington School District in Burlington, VT. Tom Elliott has a Bachelor of Science in Information Technology (BSIT) Information Systems Security from the University of Phoenix. Currently looking at Master's programs. He also served 8 years active duty service with the United States Army as a Signal Support Systems Specialist. You can contact him directly via email at tommygunsster@gmail.com, thomas@mastacontrola.com, or on the FOG Forums. Greg Grammon a Sysadmin for Fort Hays State University in Hays, KS. His username on the FOG forums is Junkhacker. Lee currently works for the NHS Ambulance Service as a Senior IT Engineer. Most of his contributions to the FOG project are related to new feature developments and help drive modular style imaging. You can contact him directly via the forums. Travis works for a public school district as a computer support specialist. Most of his contributions to the FOG project are related to feature integration and coding on the web UI. Dan works for a public school district in Rockwood, PA, USA as a Technology Assistant. His titles include too many to count and if he takes a day off there are mass panics. Most of his contributions are testing new features, mass troubleshooting and confirming bugs, wiki updates, and suggesting more a simpler streamline FOG. It is his hope FOG will expand and compete with other streamline imaging software and systems. I have been toying around with FOG since build .30 I kinda got in a little late to the party. joined the forums a year later. I had used fog personally and then introduce this software to the hospital I work for. I provided my own equipment to demonstrate the benefits to using it in our environment, only 1 drawback. I was a total Linux NOOB. I muddled through, configured the original PXE boot and the menu options. I provided my organization with a free alternative for cloning systems on the go while providing a method of booting systems that were corrupted, and recovering lost data. All this was made possible with the FOG software with special thanks to the hard and dedicated work of the founders, Chuck Syperski & Jian Zhang. Also want to shout out to the additional members of the team for their hard work and the dedication that has provided you with many new updates and added features. I had spent many hours of researching commands, investigating Linux distro's and have had many pleasures in troubleshooting Ubuntu changes.. lol now I'm a bit more familiar with FOG and its configs, I hope to offer up my experience and ability to seek out those problems/bugs that plague the everyday user so that the development team can fix them quickly. Mr. Workman works at a high school in St. Louis as a Technology Specialist, and oversees roughly 500 network-connected devices with about 900 users (among other systems) within an Active Directory / Open Directory environment. Holds an AAS degree in Computer Support from Jefferson College, along with CompTIA A+ & NET+. He's an experienced .NET framework programmer, BASH scripter, PHP writer, MySQL troubleshooter, Powershell scripter, Batch scripter, full LAMP stack developer, and Active Directory Administrator. He began testing the latest version of FOG in January 2015 due to needs of custom Multicast settings, and has worked closely with the Senior Developer to integrate support for Fedora 21, Debian 8, Ubuntu 15, and Fedora 22 into FOG, and has written numerous WiKi articles for installation and troubleshooting fog and is an active moderator on the fog forums, and is now the lead Technical Writer for the FOG Project. Mr. Zuchowski is a IT Administrator for Mansfield Elementary School in Port Murray, NJ and is also the owner of Sirus Computer Systems. LLC in Stewartsville, NJ. Administrator to over 700 Computers and 6 Servers. Active Directory Specialist. Network Administration and Installation. Security Administration, IP Cameras, and Installation. Smart Board Installations. Handle IT Administration for small and large corporations. Honda Corporation, Police Departments, Pharmaceutical, Law Firms and many other small businesses. Partners with Barracuda Networks, Lenovo, Bit Defender, and Video Insight. Fog has changed the way I handle my everyday IT Administration. Hands down, one of the best open source software I have ever worked with. Beta testing since early 2014. This page was last edited on 3 September 2016, at 17:02.